The A 2 was re-developed from scratch so as to be able to uncompromisingly achieve the highest sound quality using dynamic headphones of all types. The A 2 impresses not only with its unbelievably natural and powerful airy sound but also with its clear housing design, for which it has already been awarded the renowned “Red Dot Award: Product Design 2014”. When it comes to fulfilling the full sonic potential of outstanding headphones such as the beyerdynamic T 1, every tiny detail of an electrical amplifier circuit is of decisive importance. 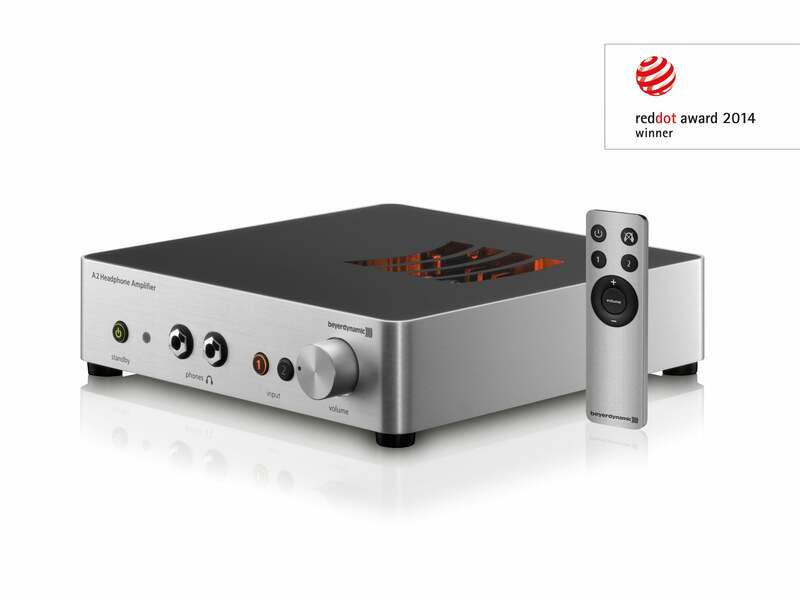 To achieve this, instead of using an integrated circuit, the audio specialists from Heilbronn have equipped the A 2 with a manually assembled motherboard with durable, discrete components. This design with ample space between the key components prevents internal interference and leads to better separation of channels with minimal crosstalk. A generously dimensioned toroidal transformer ensures stable power supply free of disturbances from mains voltage fluctuations. As a unique highlight, the A 2 provides separate adjustments for the impedance and sensitivity of the connected headphones, making it currently the only device on the market with this feature. Slide switches located on the underside allow you to set the output impedance according to the impedance of the headphones used. This means that headphones of between 16 ohms and 600 ohms can be operated perfectly on the A 2 without distortion occurring at high levels. 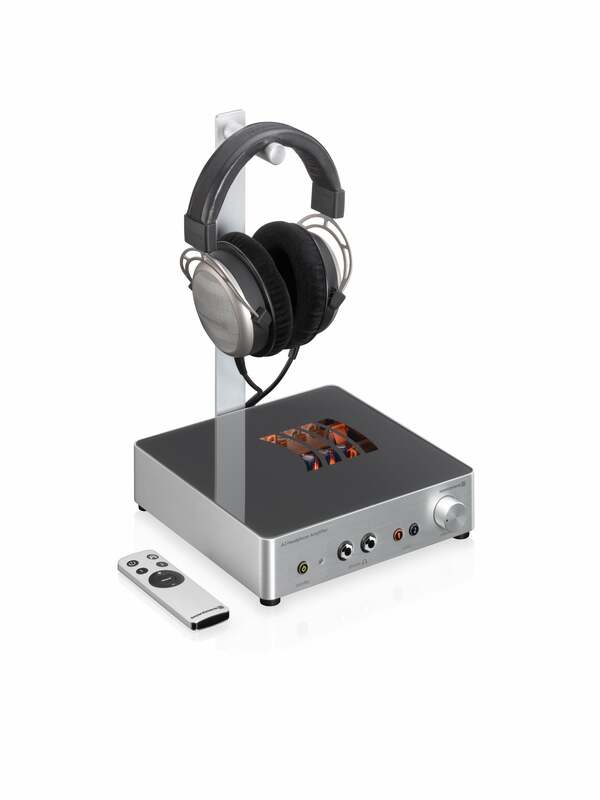 An additional gain switch is used to adjust the level of the connected source and of the headphones, which means that you can always set the volume over a wide and practical range using the level control at the front. 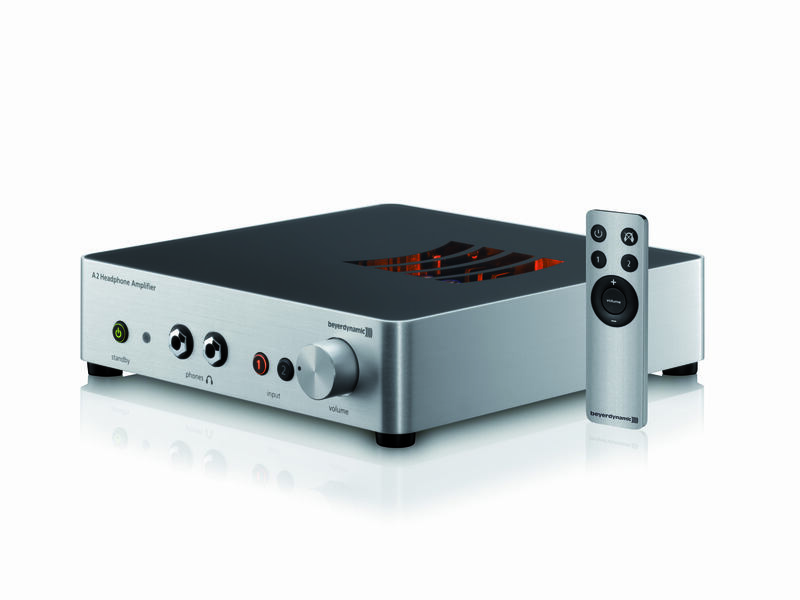 For setting the volume, the A 2 has an ALPS potentiometer with high channel synchronisation. 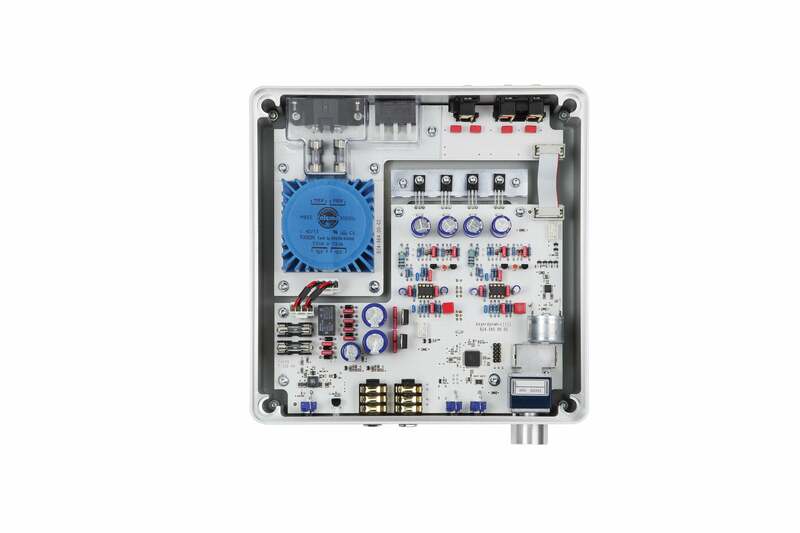 An additional motor on the potentiometer allows you to sensitively and continuously adjust the volume using the supplied infrared remote control, which comes in a handy-to-use aluminium housing. Like its little brother, the A 20, the A 2 top-of-the-range model is based on a clearly structured design concept with rounded housing edges and without visible joins, screws or rivets. 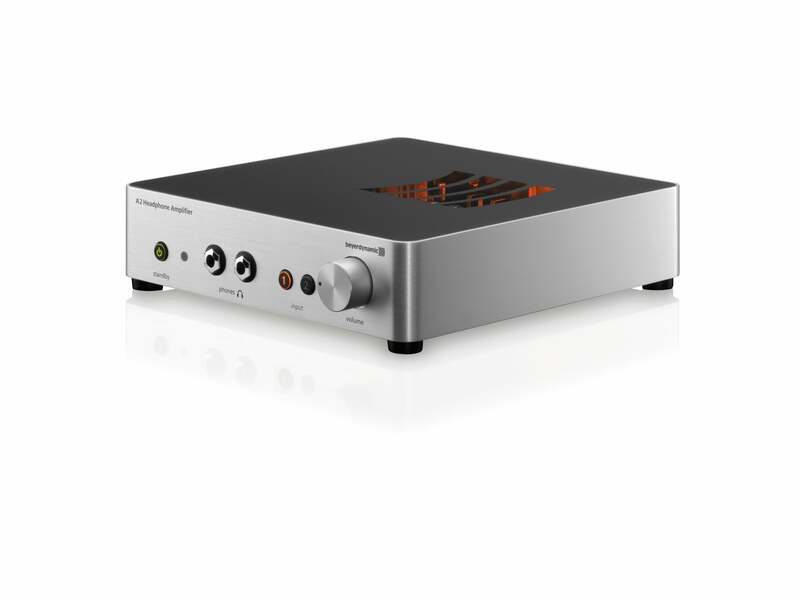 Particularly eye-catching is the anthracite-coloured glass plate that is embedded flush into the top of the headphone amplifier; it allows you to glimpse into the fine inner workings of the A 2 through the famous beyerdynamic soundwave logo. LEDs bathe the circuit board in a warm light. 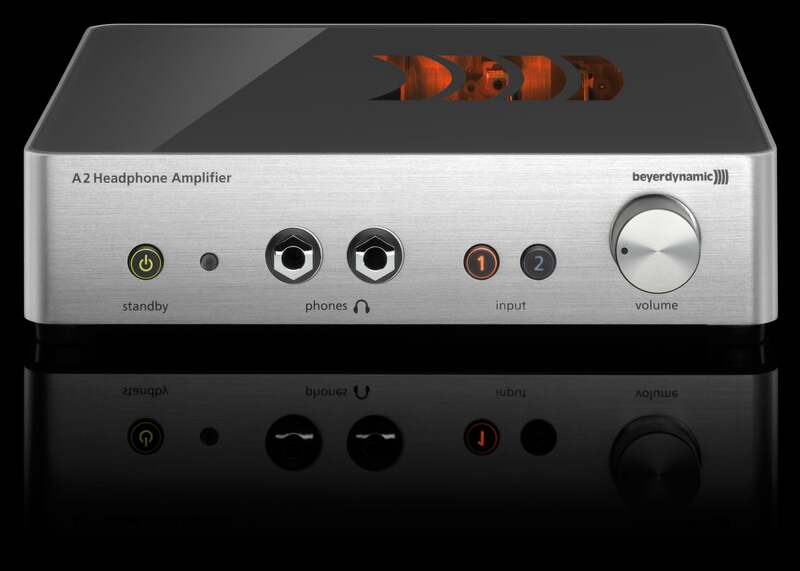 The A 2 excludes integrated digital circuitry and is therefore aimed specifically at music fans who already have a high-quality DAC or who purposefully do not want one so as to achieve a purely analogue signal chain..
Two stereo cinch inputs are available for connecting sources. You can toggle between them using the input selection buttons that are backlit in orange on the front or using the supplied remote control. In addition, the remote control has a mute function. 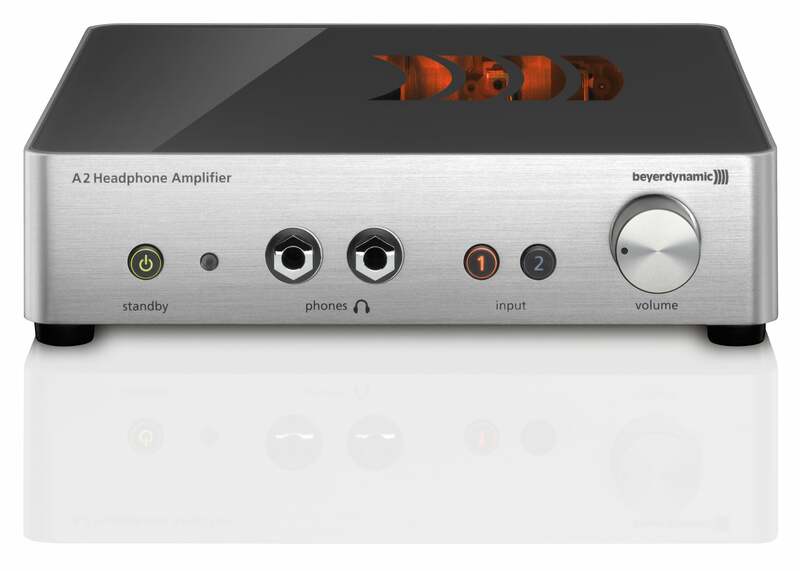 A looped-through analogue high-level output allows you to easily integrate the A 2 into an existing HiFi system, e.g. 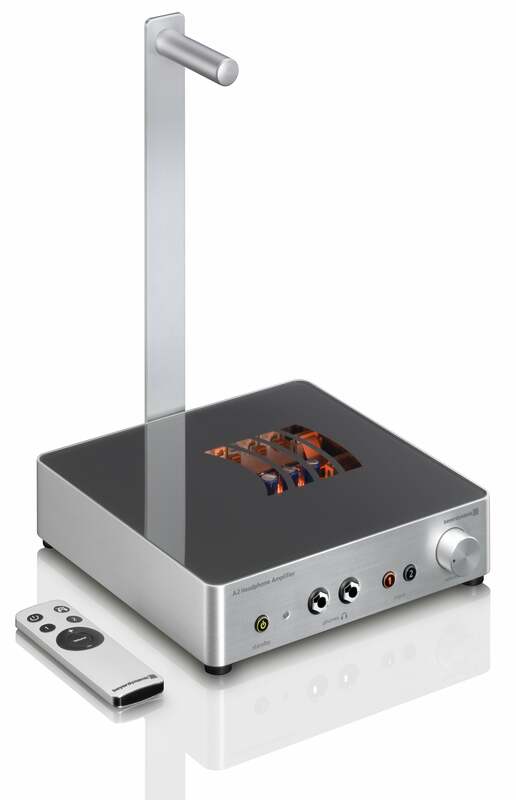 between the CD player and the amplifier. Two long-life 6.35 mm (1/4”) Neutrik jack sockets are available on the front for connecting headphones. So the A 2 can easily operate two dynamic headphones at the same time, even if they are high-impedance models. All connections, including the Neutrik jacks on the front, have corrosion-proof, hard gold plated contact surfaces. You can use the standby button backlit in green or the remote control to put the A 2 into power-saving standby mode (<0.45W). Each A 2 comes with the exceptional extra of a stable headphone stand made of aluminium, which can be attached to the underside. Thus the A 2 offers a practical storage solution and also keeps the headphones conveniently available at all times, suspended above the housing. The main objective of the A 2 is to play back music in a way that is as faithful as possible to the original, and, in this regard, the goal has been fully accomplished. With its powerful and lively response, the A 2 brings out top performances from all dynamic headphones. Amazingly noise-free operation and precise control can be enjoyed via all headphones that are connected, regardless of their impedance. With equally brilliant resolution, the A 2 is capable of effortlessly handling delicate highs as well as absolutely authentic mid-range and voice reproduction. Neutrally tuned top-class headphones benefit in particular from its deep, natural bass. beyerdynamic will be presenting the A 2 at High End in Munich from 15 to 18 May 2014: Hall 4, Stand N 04 / O 01. Anybody who is interested will be able to try out the A 2 with dynamic headphones of all price classes. The A 2 will be available for purchase from select retailers and at www.beyerdynamic.com starting mid May 2014 at a retail price of EUR 1,490 / $ 1,999. 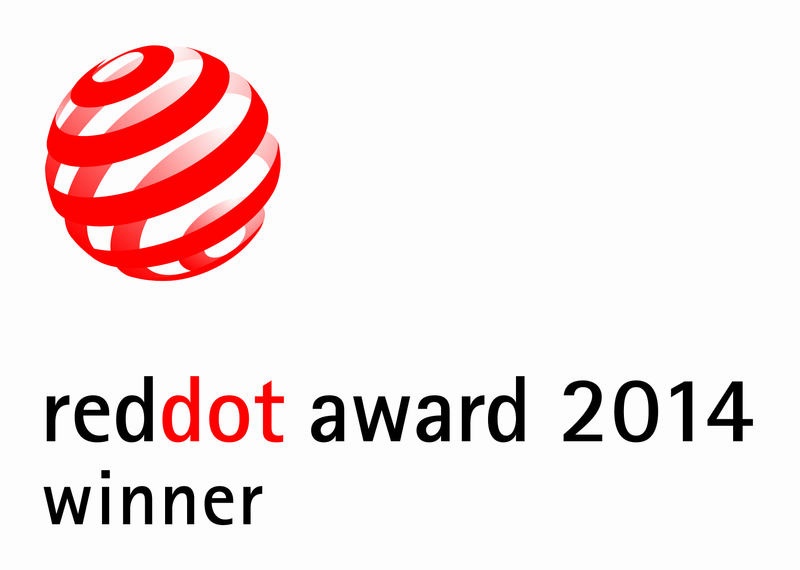 Logo English "Visit us at High End Munich"